HostPresto Review 2019: Is HostPresto a Good Hosting? HostPresto is a U.K. hosting company with its own U.K. data center. Its prices are premium but its features are comprehensive, and its customer service is excellent. Established in 2001 under a different name, HostPresto provides hosting services from its own U.K. data center. The exclamation mark in “HostPresto!” is part of the name (usually) but I’ll drop it for punctuation purposes. This provider hosts more than 170,000 websites for almost 60,000 customers, and its own modern-looking website is in English. HostPresto’s shared hosting plans are pretty comprehensive when it comes to features. They all enjoy the popular cPanel control panel and an SLA-backed 99.9% uptime guarantee (but beware that you actively have to claim your compensation). Backups are retained for four months (which is much longer than with most hosts), and you can restore yourself with one click. For more advanced users, there are the usual inclusions, such as unlimited FTP accounts, PHP version 5 through 7, unlimited MySQL databases, and phpMyAdmin. Added extras include compatibility with design software (e.g., Adobe Dreamweaver, Apple iWeb, Microsoft Expression) and free Attracta SEO tools. To top it all off, there is also a free Cloudflare CDN. An added-cost drag-and-drop website building tool comes with hundreds of ready-made templates, integrated maps, PayPal, slideshows, and more. And if the shared hosting plans don’t give you what you need, you can opt instead for one of the specific WordPress, Magento, Joomla!, PrestaShop, PHP, or Django plans. 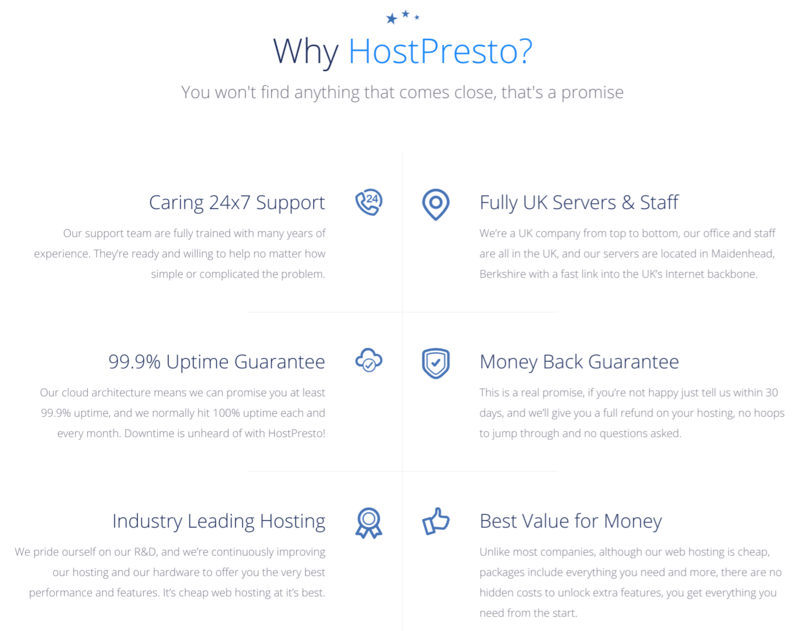 Despite advertising “Cheap Web Hosting from the UK’s Leading Hosting Provider” on its home page, I think that HostPresto’s plans are pricey, but they offer good value given the resource levels and features. You can purchase the plans on one-month to three-year terms, with the price reducing for the longer-term commitments. If you’re concerned about committing for a full three years, you might take comfort from the 30-day money-back guarantee that will get you out within the first month if it all goes wrong. There is no free trial, but there is a coupon that cuts the cost for the first month. If you prefer to solve your own support issues, you can refer to the extensive help section and comprehensive community pages on the HostPresto website. Launched in 2001 (as Dream Hosting), incorporated in 2006 (as Enix Ltd.), expanded into the cloud in 2010, and rebranded as HostPresto in 2014, this vendor now has more than 300,000 registered domains to its (new) name. Aside from the high prices, I really can’t complain about this company’s feature-packed plans and comprehensive customer service. Wondering how HostPresto stacks up against other Web Hosting companies? Enter any other Web Hosting company and we will give you a side-by-side comparison.